Fishing overall has been good with some nice catches in the lakes on bait and fly plus also a few on the troll. *Had a session last Thursday night with the fish coming on very late at about 8.30pm. Managed to hook five on midge balls including a nice brown. Stuart caught two and Dave one. It was a tough night with only a very brief period when the fish were up and feeding. *Steve Samuels reported that the daytime fishing was still good in the lake. Small beadhead nymphs have been working well for him, letting them sink down deep followed by a slow retrieve. Lake Jindabyne:- Jindabyne reports have been scarce again this past week but there should be some good early morning fishing and late evenings too. Streamer patterns like the fuzzy wuzzy, craigs nightime, and woolly buggers will do well after dark. Black Muddler minnows and mudeye patterns should also catch a few. *Have had a report this morning (22nd) of fish moving on Midge in Jindabyne with quite a few balling up. The angler reported catching four nice fish and plenty of fish rising. 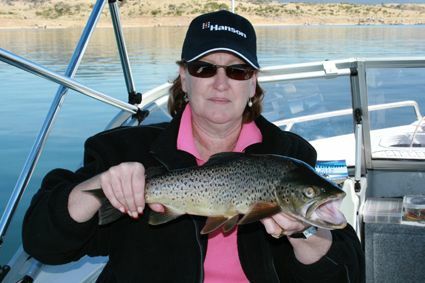 *Claire Walsh with a very nice Jindabyne brown. A great way to christen a new boat. There have been numbers of dragon flies on the wing so some mudeyes have certainly hatched. Mudeye fishing will improve further over the next couple of weeks. Fishing a mudeye on the bottom has worked well for some using a small cork float stopper to lift the bait out of the weeds. *Berridale local Ken Cain had a good session on Friday evening in the Buckenderra area catching three nice rainbows on sherbert powerbait.